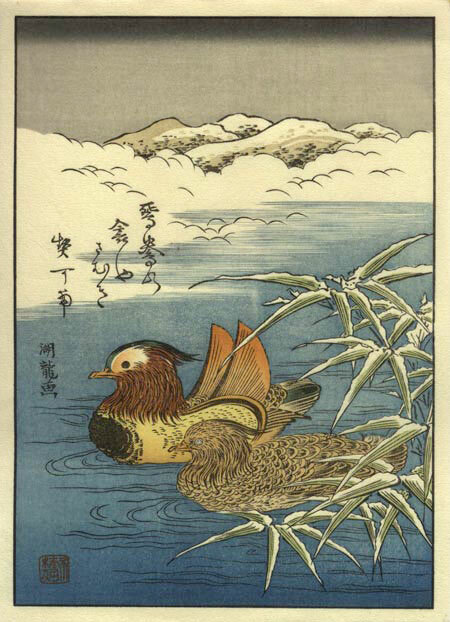 Description: This design was created just over two hundred years ago by Isoda Koryusai, one of the designers who worked in the period immediately preceding the introduction of full-colour printing. The poem on the print can perhaps be paraphrased as something like: 'Our warm love will be all the blanket that we need ...' Mandarin ducks are an old Japanese symbol for a happy marriage, as they were thought to mate for life, but as modern research has taught us that the real facts of duck 'togetherness' are somewhat different, it seems that we may have to find a new symbol to replace them! Note: This print was originally published by David in his Surimono Albums series. He made approximately 200 copies of each of those prints, and distributed them only in album form, never as single prints. It is his idea that after the 200 album sets of any particular album have been sold, the blocks (still in absolutely perfect condition) could then be used to produce prints to be added to the Mokuhankan catalogue, with the printing being done by hired craftsmen working under his direction. The first Surimono Album is now out-of-print, and this is one of the designs from it.